In today’s playout environment, ease-of-use is more than a luxury. It is a business necessity. With Gallium PLAYOUT scheduling, asset management and automation system, we have challenged assumptions about complexity and productivity in master control. Of course, elegance does not mean compromise. Under its covers, Gallium PLAYOUT is built to the highest standards with enterprise-class, scalable automation transmission sensibilities built on the latest IT technologies including a client/server architecture, advanced redundancy and reliable failover features. Gallium PLAYOUT supports today’s multi-format distribution requirements and manages simultaneous delivery of traditional broadcast, web, mobile, IPTV and file-based content formats as needed. 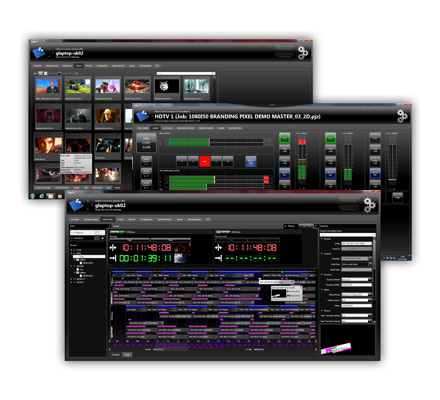 Gallium PLAYOUT is designed for rapid deployment, effortless integration and adaptable workflow. Gallium PLAYOUT of course drives a range of Pixel Power playout products with unlimited control of Pixel Power’s graphics engines. Gallium PLAYOUT also works with your existing infrastructure for archiving, media asset management, transcoding, traffic, automation, scheduling and subtitling. Gallium PLAYOUT is there to enhance your operations, not create new challenges. The intelligence of Gallium is most easily seen in its user interfaces. Thoroughly modern interfaces—the kind you’d expect to see on a shiny new tablet– optimize the delivery of information, abstract complexity, and provide operators with the shortest path between thought and action. Extensive automation reduces workloads and ensures consistent operations. That elegance enables facilities with Gallium to deliver more channels per operator.